Estate Gardens at Fonmon Castle GardenOriginally, the Castle was surrounded by outer defensive works that enclosed about 2.5 acres. As time passed and the need for defence faded, this enclosure was converted into the present flower gardens and fruit and vegetable growing areas. Due to the steep ravine immediately to the East of the Castle, these spaces lie to the North, West and South of the main building. On the East, the Castle is backed by mature woodland mostly planted in the 19th or early 20th centuries. There are extensive open spaces, some extending even beyond the original enclosure, almost all laid down to lawns which are superbly maintained by Head Gardener Alun Taylor and his team. 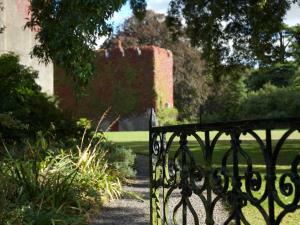 Creeping vines cover ancient stone walls & trimmed hedges border ornate beds & exquisitely manicured lawns. Shady fern groves and a number of remarkable trees, some of which are associated with personal stories of past castle inhabitants. The Castle is open to the Public from April to September. There is no need to book. Public opening times for individuals, families and groups of less than twelve are on Tuesdays and Wednesdays between midday and 5pm. Last entrance to the garden is at 4pm. Warning – Using SatNav to approach Fonmon can cause problems. We have a unique postcode which does not ‘link’ to a public highway. Hence you may be told ‘you have arrived’ when you are anywhere up to ½ mile away…..
From Junction 33 of the M4 follow A4232 towards Cardiff. Bypass the airport to the north following A4226/B4265 towards Llantwit Major. Do NOT take 1st left, which is signposted Fonmon (the village), but continue under bridge for another two thirds of a mile. Follow brown tourism signs, firstly left towards Rhoose and East Aberthaw. Then, 100 yards beyond the top of the small hill, turn left again into Castle Road. Go over traffic lights and our lodges are at the end of Castle Road, with the gates on the left.